Carey Davidson is the founder of New York City based, Tournesol Wellness, a groundbreaking integrative medical and healing arts center on Madison Avenue. Carey is a Reiki Master, an Intuitive Energy Specialist and the creator of The Success Alchemy, a program designed to provide strategic and achievable tools for optimal wellbeing using Ayurvedic Holistic Lifestyle Guidance, Vibroacoustic Sound Therapy and Five Elements Psycho-Spiritual Development. Carey is also the Executive Director of Tournesol Kids, a 501c3 non-profit organization dedicated to the physical, emotional and spiritual health of every child. Carey is a mother of three. Several years ago, Carey and I did a project together. As part of our work, I got the chance to try a Vibroacoustic Sound Therapy session. The session was phenomenal. The room was set up similarly to where you would go to get a massage, but with a custom table. Carey and I chatted about a few things going on in my life, then she selected a frequency and left me to relax on a vibrating water-filled table in the dark, cozy room. I left the session not totally understanding what had happened, but feeling rejuvenated. I was excited to reconnect with Carey to learn more about the science of the incredible therapy I experienced and how it can be used as a powerful tool for healing mothers. 1. What is Vibroacoustic Sound Therapy? Vibroacoustic Sound Therapy (VAT) is a science-based treatment that uses mild vibrations and soothing music to align the body and mind with healthy cellular behavior. National Institutes of Health has been reporting on the efficacy of using Vibroacoustics for physical and emotional challenges for over 30 years. Research-backed benefits of VAT include: symptom reduction, pain management, stress alleviation, removal of cellular waste, increased circulation, enhanced metabolism, release of muscle tension, deep relaxation and more. Read the research. Vibration is a fascinating way to address health concerns. Human cells are vibrating all the time and they brilliantly copy any vibration that is introduced to your system. When your cells are vibrating within what is considered to be the healthy range (about 30 – 120 Hz), you will feel well and resilient to emotional and physical triggers. When your cells are vibrating outside of the healthy range, you can experience negative symptoms - anything from mild hunger to chronic pain. At Tournesol Wellness we offer over 100 customized frequencies. Each individual session warrants a personalized frequency as the root causes of physical and emotional issues vary vastly from individual to individual. We house the only liquid sound table in the tri-state area. 2. What is a Vibroacoustics Sound Therapy session like? During your session you will lay on this luxurious treatment table topped with a water mattress for a deeply immersive session. Vibrations and music are transduced through the table for the duration of the treatment. Each session lasts either 30 or 60-minutes. and the lasting effects of VAT can be felt from between two to seven days after the first session. Most people report a significant shift in symptoms after three sessions and cellular behavior change is noted after between 10 – 15 sessions. While in theory, VAT seems similar to sound bathing, it differs in that it is a much more personalized and physiological experience. 3. What are some reasons that new moms will come to see you for VAT? New moms struggle with various physical and emotional challenges after giving birth. It takes a while to feel like yourself again and VAT is a terrific way to de-stress and begin to heal. VAT is a non-invasive method of settling emotional imbalances, improving sleep and soothing aches and pains. 4. How can VAT help new moms heal? New moms can feel like they’re being hit from every angle. You may not be getting enough sleep each night to properly recover, you may not be eating or drinking enough, your hormones are probably all out of whack and often it feels as though your life has been turned upside down. This is not a recipe for success and ease of healing. VAT can be a wonderful way to destress and quickly restore balance. Unlike disciplines like meditation and yoga, you don’t have to do anything for VAT to work. The vibrations will do the work for you. Physiologically, VAT speeds up circulation, slows heart rate, lowers blood pressure and puts you in a parasympathetic nervous state within minutes. 5. How are different frequencies used to treat different individuals? Everyone who comes for VAT completes our online assessment. The results help us map out a road to success for each person. The assessment information allows us to predict emotional and relationship-based roadblocks and then help prevent them by running the appropriate frequencies and teaching skills for self-awareness and self-regulation. We have frequencies to support almost any physical, emotional, or spiritual imbalance including the entire endocrine system, each organ, the Chinese Meridians, chakras, sections of the spine, hips, knees and feet. We also have frequencies for migraines, CBD, MS, fibromyalgia, arthritis and even one especially for pain in the hands experienced by guitar players! Once we understand your symptoms, your goals, your nature and your tendencies under stress, we can easily customize a VAT playlist. 6. I took “Five Elements” archetype test, how do the archetypes help you to determine the frequencies used in VAT? The Five Elements refer to the Chinese Medicine model of how people grow and transform. The five elements are referred to as fire, earth, metal, water and wood. In my work I use the five elements psycho-spiritual-emotional development correlations to help people better understand themselves and their button-pushers and help them self-regulate. Once I know your primary nature among the five elements, I know exactly what VAT frequencies you need and what supportive advice you will need to feel better. For example, a VAT session for someone whose primary nature is Fire will likely include frequencies for the heart meridian as well as lung and kidney meridians. These frequencies will help balance the person with fire nature. Fire natured people who have trouble sleeping may also receive support for their adrenal gland and third eye. These frequencies will help support better sleep. Additionally, Fire people are notoriously shallow breathers. When they feel unsafe, Fire types tend to hold their breath and experience panic and anxiety more than other types. When a Fire person begins to feel stress, it can be helpful to focus on a nice slow exhale. Also, to become more resilient to stress triggers for the long run, we might suggest that Fire people be sure to drink enough water and focus on getting good sleep – even more so than other types. 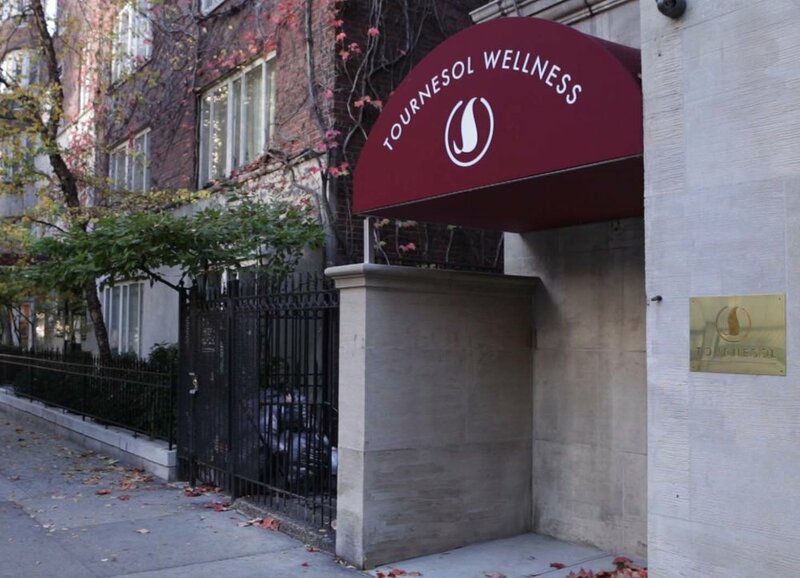 If you’d like to try a Vibroacoustic Sound Therapy session, you can contact Tournesol Wellness at (646) 395-1114. You’ll receive $20 off your first 60 minute session when you mention this post.
" Fostering mindfulness in our children is absolutely essential," says Carey. "Research has shown that 1 in 4 kids is anxious, aggression and poor mental health are becoming more commonplace and obesity rates are rising. Children who engage in the Tournesol Kids programs see a rise in their feelings of self-worth, empathy for the needs of others and improved self-regulation / problem solving skills that together build a foundation for good health, greater success and an overall better society." Your donation will provide the activity cards for families and educational institution that are in need of support.